You may already be familiar with the term snackable content. It's a buzzword in the content marketing industry right now but it has legs. Snackable content is simply a small piece of content, visual or audio, with a clear sense of purpose that you can digest in a very small amount of time. You can easily create snackable content for your business as long as you have a strong overall content marketing plan in place and you can consistently produce high-quality content. Whether you prefer podcasting, live video, blogging or video blogging, you can turn your long-form content into multiple pieces of short-form content. I typically format my content to include key points that support a trend or solve a problem. If you create content in this way, extract those key points in a way that makes each stand on their own. Then, create a mini-episode, micro-blog or a set of images to share on their own. 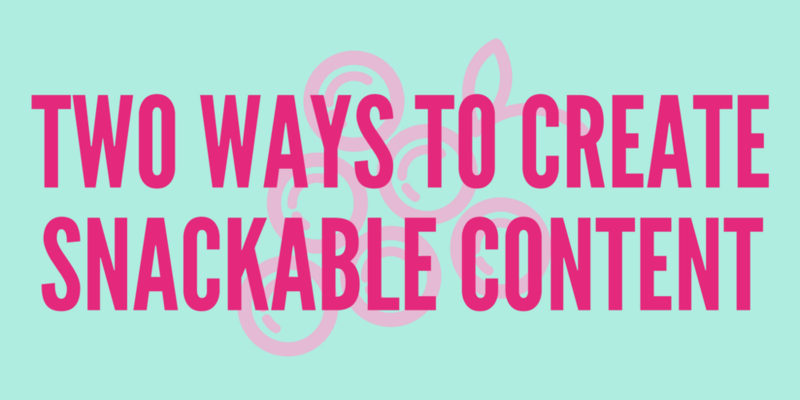 For example, with this post, I could (and will) create one tip around creating snackable content from long-form content and one tip around creating snackable content from quick tips! I enjoy reading industry news and trends. While they might not easily become longer pieces of content, it is information I can share quickly in a way that's easy to consume. It's tough to resist the urge to turn everything into a "weekly digest" but posting something short and sweet keeps content timely, relevant and digestible. This could show itself in the form of a quoted retweet or an entirely new post with a link to the source. The most difficult part to remember is to build these quick opportunities to serve your customer into your content calendar. Include their creation as part of those long-form types of content and get into the habit of looking at experiences and events through your content creator lens. What type of short-form content do you want to create for your business? I want to hear from you. Already creating snackable content? Share what's working for you in the comments below.